With their reputation for cunning, few animals play as prominent a role in popular culture and folklore as the fox. This is partly due to the fact that foxes live in closer proximity to humans than most other wild animals. 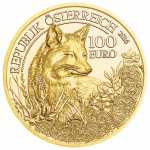 So widespread is the red fox that this member of the wolf family is not an endangered species. 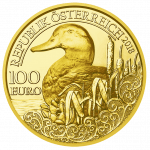 With a maximum mintage of only 30,000, and containing half an ounce of gold, the beautifully finished fourth coin in our Wildlife in our Sights series is, however, far rarer. Immortalised in the popular Christmas carol Good King Wenceslas, the Duke of Bohemia became the patron saint of the Czechs following his assassination in AD 935. 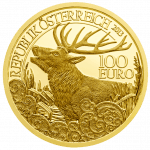 The crown crafted in his honour is likewise immortalised in this expertly engraved coin by Herbert Wähner. A relict of mystical proportions due to the legitimacy bestowed on those crowned with it, the Crown of St Stephen takes its name from the first Christian king of Hungary. 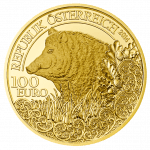 The ‘Latin Crown’, as it is also known, is the superb third coin in our Crowns of the House of Habsburg series. Affectionately known as the ‘Archduke’s Hat’ due to the red velvet cap in its lining, the Archducal Crown was a symbol of authority never actually used in coronations. 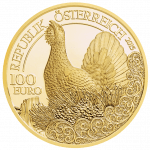 It is a relic of exquisite beauty nonetheless, as shown by the second coin in our Crowns of the House of Habsburg series. Displayed today in the treasury of the Hofburg in Vienna, the Crown of the Holy Roman Empire was once among the most coveted in Europe. 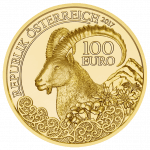 The first in the Austrian Mint’s impressive five-coin Crowns of the House of Habsburg series, this handsome 100 euro gold coin is itself a treasure to be coveted.